Australia v New Zealand breaks new ground on Saturday when it is played at Docklands Stadium, Melbourne, the 21st venue to have hosted the rivalry. This would seem to make the Trans-Tasman contest the most travelled as well as the most played of international fixtures. England v Scotland, which has been played longest, has taken place on 13 grounds while Wales v England has happened on 18 and South Africa v Australia on 19. After a decade that has encompassed three sponsors names - Colonial, Telstra and since 2009 Etihad - Docklands has won wide acceptance as an Australian Football venue, even if many AFL fans would contest the recently-stated belief of stadium manager Ian Collins that it is a better venue for the game than the fabled Melbourne Cricket Ground (MCG), which is not merely the historic home but the birthplace of the code. It may, though, be a better venue for rugby, with its tightly enclosed space, covered by a retractable roof, better adapted to the game than the vast expanses of the MCG oval. The ARU certainly appear to think so. This will be the 23rd rugby international played in Melbourne, and the 17th at Docklands. Only one international, against the All Blacks three years ago, has been played at the MCG since Docklands opened. The previous 16 matches include seven at the 2003 World Cup, many leaving vivid memories. New Zealand's two pool stage victories, over Canada and Italy, are probably most fondly remembered by current squad members Mils Muliaina, who scored four tries against Canada, and Dan Carter - then still a squad player - who claimed 34 points in the two matches but did not play in the quarter-final win over South Africa. 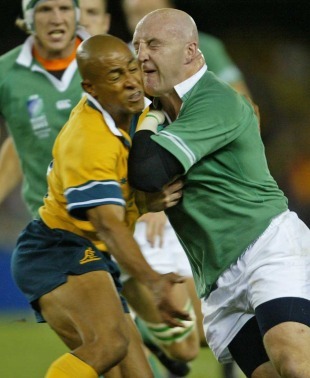 Other contests, though, included Australia's grippingly tense 17-16 pool stage defeat of Ireland, highlighted by a Brian O'Driscoll try only explicable to the naked eye by his having escaped two would-be tacklers in a very crowded corner via a hole in the space-time continuum. There was the '16 men' incident as England came from behind to beat Samoa, and the extraordinary scenes in the press conferences following France's comprehensive quarter-final victory over Ireland as the usually hard-to-impress journalists gave retiring Irish captain Keith Wood a standing ovation, then the standard direction of questioning was reversed as the platform party started quizzing the journos standing at the back. The reason was that the back row had a clear view of the stadium screens which were broadcasting the last quarter-final from Brisbane, in which Wales were - at least at this stage - running tournament favourites England to distraction. There were memorable Docklands moments even before that. It was where Australia's fight back following its hammering in the first Test of the 2001 British Lions series began. Worried by the way Lions fans had turned the first Test at Brisbane, a city far more concerned by that weekend's State of Origin rugby league contest, into a home match, the ARU took measures against their next venture into alien territory producing similar results - combating the psychological effect of the massed red replica shirts of the Lions fans by handing out thousands of gold scarves then saw the match turn on Joe Roff's interception of a Jonny Wilkinson pass early in the second half. Australia won 35-14 and went on to take the series. Jonny, though, was to have his Docklands revenge as one of the architects of England's 25-14 victory there in June 2003, reckoned by some to be perhaps the best single performance of the Clive Woodward era, and a crucial step towards winning the World Cup five months later as England proved, to themselves as much as anything, that they could beat the Wallabies on their own ground. "Australia, though, continued to struggle against teams whom other major nations - probably wrongly - did not regard as worthy of Test status." That was the only time that Australia have lost in 10 Tests at Docklands, and only the third in their 16 matches in Melbourne. The second was a 33-18 loss to the All Blacks at the MCG in 1997, watched by a crowd of more than 90,000. The first came in the debut international in Melbourne, played at Olympic Park in July 1958, and shows quite how far Australia has come in the half century or so since. It was against the New Zealand Maoris, whom Australia had recognised as a Test opponent since 1922 and had never found easy opposition - winning eight, losing six and drawing two. Almost all of the Australian team had been on their tour of Britain, Ireland and France the previous season, while the Maori team - admittedly in an era when opportunities to win All Black caps were limited - was short of top level experience, with only skipper Pat Walsh, a centre, and scrum-half Keith Davies, first choice on the 1953 tour of Britain, Ireland and France - also All Blacks. But after drawing the second match of three in heavy weather the previous week in Sydney, the Wallabies were well beaten, 13-6 in fine conditions at Olympic Park with the tourists scoring three tries to nil through prop George Koopu, wing Morris Raureti and first five-eighth Eddie Whatarau. The 1-1 draw in a three-match series precisely echoed the outcome when the teams had last met, in 1949. Though the first match in Melbourne, it was the last in this particular series, with no further Australia-Maori Tests. Australia, though, continued to struggle against teams whom other major nations - probably wrongly - did not regard as worthy of Test status. Their next venture to Melbourne - and last for 33 years - in 1961 produced a 3-3 draw with Fiji. Prop Tony Miller was winning the 29th cap of a 41-Test career that lasted from 1952 to 1967. That only nine of those matches ended in victory was no reflection on a tough and durable forward. Only one Australian of this era came close to a winning record in a lengthy Test rugby career. Scrum-half Des Connor, captain in 1958 against the Maoris, moved to New Zealand in 1960 and won a dozen All Black caps. Winning 10 of those 12 matches with one draw exactly reversed his record for Australia, with the ironic conclusion that he was denied a winning record by defeat in his final All Black Test - against, of all people, Australia at Wellington in 1964.